Providing a detailed collecting experience for fans of the Women's National Basketball Association, 2017 Rittenhouse WNBA contains a complete base set and two key autographs. 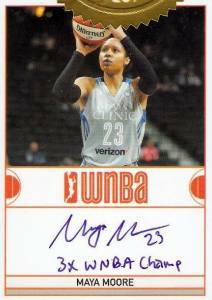 Like the previous WNBA sets from the card maker, the 2017 Rittenhouse WNBA Basketball checklist highlights every team with veterans and rookies. The 110-card base set features at least seven players from each franchise and a full set comes in every box. Applying a premium element, the two signed cards per box are not for just any players. Kelsey Plum, the number one pick of the San Antonio Stars in the 2017 WNBA Draft, has an autograph in every box. The 2017 rookie played college basketball at the University of Washington. The other signature is from modern legends Maya Moore of the Minnesota Lynx or Sue Bird of the Seattle Storm. Both were included in the WNBA Top 20@20 list, which honors the 20 best players from the history of the league as it reached its 20-year anniversary in 2016. The signed choices for all players consist of three image variations, including street clothes, posed in uniform, and an in-game action shot. Bird and Moore also have a variety of rare inscriptions to hunt down. Limited to just 500 boxes, 2017 Rittenhouse WNBA Basketball is priced at $169.99 per box. 110 cards. Shop base sets on eBay. 9 cards. 2 per box set. Shop on eBay. Moore and Bird have added inscriptions.